National Childcare Credentials: Nevada child care providers may use our courses toward a CCP or CDA, as well as CDA, NAC and CCP renewal. Click to learn how the CDA can benefit you in Nevada. Nevada Childcare Training Requirements: All Care Courses (with the exception of Abuse and Neglect, Emergency Preparedness in Child Care, Transportation Safety and Understanding and Managing Allergies in Child Care) are approved by the Nevada Registry for professional development training hours for directors, caregivers, providers, volunteers and licensees in child care facilities including child care centers, family homes, group homes, residential child care institutions, shelter child care institutions, special needs facilities, nurseries for infants and toddlers and outdoor youth programs. All Care Courses certificates include Nevada Registry’s course approval codes. Our course Keeping Infants Safe may be used for annual clock hours in Nevada, but it cannot be used to meet the Nevada requirement for SIDS training. Our course Preventing Child Abuse and Helping its Victims may be used for annual clock hours in Nevada, but it cannot be used to meet the Nevada requirement for training in child abuse and neglect or SIDS, which must be taken in the state of Nevada. Our courses are listed on the Nevada Registry website. First click the “Training Calendar” link, then select “Internet Course” from the drop-down menu under “Online and Distance Learning Options” in the middle of the page (next to the map). Need to fulfill the annual 2-clock-hour Obesity/Wellness/Nutrition/Physical Activity training requirement? 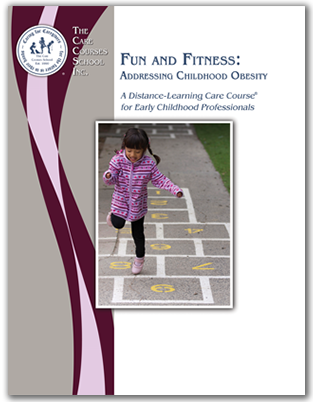 Our course Fun and Fitness: Addressing Childhood Obesity can be used to fulfill the Obesity/Wellness/Nutrition/Physical Activity training requirement for Nevada. Eight of our courses can be used for your Child Development/Guidance and Discipline training requirement. Nevada training requirements for caregivers under 18: The Nevada Registry has approved two of our Care Courses for students who are not able to complete the required "course in the development of children" at their High School. Please click here for more information. Opening a child care facility in Nevada: For those of you interested in starting a day care or home-based child care facility in Nevada, please contact your state licensing agency using the contact information below. The licensing agency can give you advice on the requirements, rules and regulations of your state.